At a time when most of our goods are anonymously manufactured in faraway places, it is gratifying to discover Marco Canvas & Upholstery, a family-owned company that employs local workers to create quality, American made products, here on Marco Island. 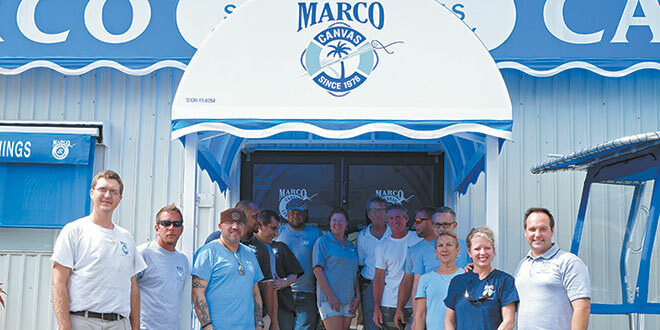 Since the day the doors to Marco Canvas opened in 1978, the Skrzynski family has dedicated themselves to providing custom fabrication with the highest level of customer service and attention to detail. In the 70s, when the Skrzynski family moved to Marco Island there wasn’t much on the island in terms of services and products. Ed Skrzynski recalls that when his father, Ed Sr. started Marco Canvas, he pretty much did everything that his customers needed. Jobs included all forms of restaurant and home upholstery, commercial and residential enclosures for tiki huts and lanais, awnings for windows and doors, shade canopies in all shapes and sizes, marine upholstery, boat coverings, yacht enclosures and much more. Ed describes it as a “broad footprint,” which helped both men develop the ability to “solve a lot of problems.” Like his father, Ed’s varied range of experience helps him create unique ways to solve his customer’s problems. In May 2008 Ed and his wife Tammy took over the business from Ed Sr. Submitted Photo Ed’s patented Liberty Covering System is available through Marco Canvas. then used his process engineering, business background and the latest technology to improve upon them. Ed didn’t change the company practice of employing talented, highly skilled tradespersons. What he added was computer technology, incorporating state-of-the-art 3D scanning/modeling, 3D computer aided drafting, 3D computer rendered models and automated robotics. These modern methods improve accuracy, reduce production time and product waste, and as a result, keep costs down. Photo by Jessica HernstadtConnie at the robotic cutting table; Jon creates a 3D design on his computer. boat is uncovered in seconds, and covered in minutes. A pulley unzips and opens the cover effortlessly, as easily as opening home window blinds. 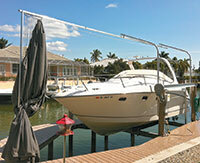 Not limited to boat covers, Marco Canvas can make nearly any fabrication. Ed says, “If it is made from metals or fabrics, chances are we can make it.” Some of the myriad products include fixed and retractable awnings, canopies, lanai enclosures, cabanas and marine enclosures, decking, carpeting, upholstery, including headliners, and all types of outdoor furniture. Marco Canvas & Upholstery is located at 991 Chalmer Drive on Marco Island, and can be reached by phone: 239-394-1718 or by email: sales@marcocanvas.com. For more information about Marco Canvas, visit their website at www.marcocanvas.com or Facebook.comMarcocanvas.